Uses there plugins on your long web content to improve user experience and boost search engine rankings. A lightweight jQuery & Bootstrap plugin used to generate a sticky, collapsible table of contents from heading tags within the document. 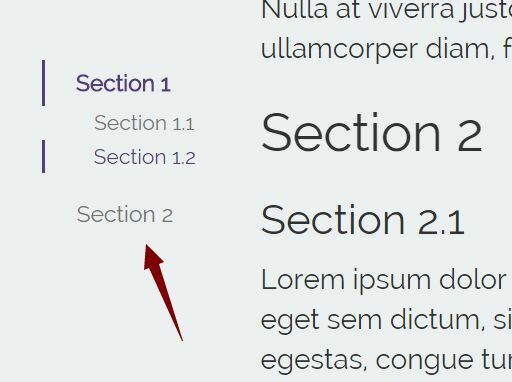 A jQuery plugin which dynamically generates a nested side navigation (TOC) from heading tags within the document, with support for scrollspy functionality. The jQuery Advanced Scroll Progress Tracker plugin automatically generates a fixed scroll progress indicator from heading elements and allows linking between them. Tocify is a jQuery Plugin for creating a table of of contents that provides support for smooth scrolling, scroll highlighting, scroll page extending, and forward and back button support. This is a pretty cool side TOC (table of contents) & navigation system which allows to highlight the current nav item with an animated progress line when you scroll through the webpage.